Yes,I like so much ships and always I look for new things about this,but is more easy to find trains and buses,ship is a very important kind of transportation,and we have a litle about this. there used to be bigger docks in game (i remember them, just i can't recall either they were for pak 128 or 64). They were much longer (2, 3 or even 4 tiles). We should make new ones (they were from MHz, IIRC). Would anyone get the Pak 128 version pak-ed and making them official for those Pak 64 standard docks did? (or if the Makeobj supported, ships with mixed cargo types. You can already do this using barges, can't you? Sojo made some tests for pak96 in that sense, dividing a big ship into several parts and coding them as a gigant ship, so I guess you could make something similar in the graphic part. Indeed, you can paint several small ships and link them as a convoy through the dat file constraints. On the other hand, I think it's already possible to create ships with mixed cargo types, coding the extra units of the convoy as hidden units, similar to what is done with the passenger and mail ships. The problem is that they appear at the shipyard menu. In really the full container vessels can transport dry goods into the container boxes and cooled goods into the reefer containers.So I think ,is necessary a ship that can transport this two kind of goods. 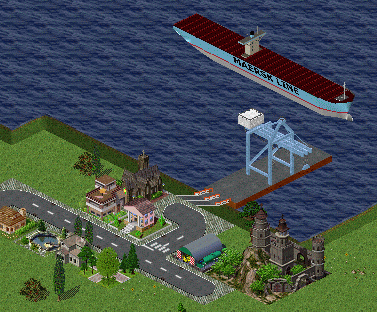 I see in a video of the simutrans PAK 64 a wonderful blue docks with cranes to container,we do not have this one to 128? How about adding the GTS Finnjet, it was the fastest, longest and largest car ferry in the world and only one powered by gas turbines. Ships like the GTS Finnjet are interesting, sure. Did you paint it already? At the moment there are 7 passenger ships with a capacity of 1000+, mostly fuel driven. Starting from 1911 or so. Then there are another 4 passenger ships: 2 Sailing ships (60 & 212 Pass), 1 steamer (310) and 1 Hovermarine (200). Imo the coolest ships you could paint are smaller fuel driven ferries (50 - 1000 passengers). These ferries would really help to connect sights on small Islands, or production sites, or smaller connections. Yeah smaller ships do come in handy, their might be some smaller ships as addons. Yeah, but it's not really 1 KM. I mean unless every rail car is up to 500 meters long. thanks for the big Ship! There are [at least] two simultaneous scales in Simutrans. Tiles are, indeed, 1km square, in some senses - mainly the distances between towns, factories, etc. But graphically, of course, they are much more like 10-15m or so square. Only in basic game. In Experimental it is free - tied on config files, if I am not wrong. But I play only basic game. Even if that's true, this is the pak128 board, so it is irrelevant. Originally the idea was to have two scales. One for sizes, and one for distances. To close the logical gap, a building on a square was meant to represent a quarter or block of buildings, but represented by a single object - so it could still span a distance of 1km, while being shown as a 20m wide building. But it was never this clearly told in the game. I'd encourage pak makers and developers to do it this way, too. Don't be too strict with sizes and scales. Be sure that it plays well, and looks good. A game can look good without being true in scales, and I'd even say it plays better if the size of objects is made to work well in the game, not if it is made to be "realistic". Another important observation, in my point of view, its about the necessity of the use of ships. Because, in the real world, ships are the most important vehicle used to transport all kinds of goods, due the quantity and the low cost of transportation, but in the game, a most part of the people prefers to use trains. If the people have a two island and a big distance, they build a bigger brigde to use train.I think it a most part of the gamers loves trains, like me too, but in the really is impossible to transport goods between Japan and Brazil for example by trains, it is mandatory to use ships, and big ships to have a low cost. And another thing too is about the depth, becouse the Emma Maersk in the game ,for example, can get inside a smmal river or waterway, but in the real world this ships can operate with a limited numbers of harbous, I think its can be good to the game a restriction of navigation according the depth.